This is not news anymore, Android is becoming or as some might say, has already become, the numero uno OS for smartphones. But smartphones market is still in its infancy and is set to explode in the coming years, especially in the developing world. In places like India, Android has been a blockbuster success, even when smartphone penetration has remained low. With the arrival of low-cost Android smartphones, this is going to change, and fast. Recent reports by IDC (International data Corporation) also suggest the same. 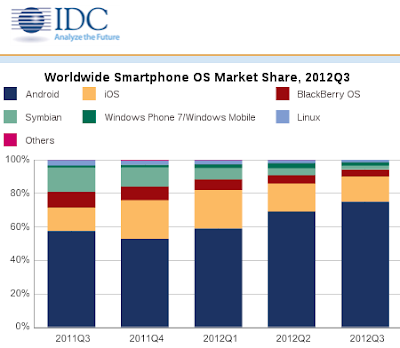 According to a recent study by IDC, 75 percent of all smartphones shipped in Q3 ran Android. Not only that, Android shipments for the quarter has touched the magical 100 million mark for the very first time, totalling 136 million. The 91.5% year-over-year growth was nearly double the overall market growth rate of 46.4%, thanks mostly to the open nature of Android OS. Android OS adoption rate is growing six times faster than iPhone. 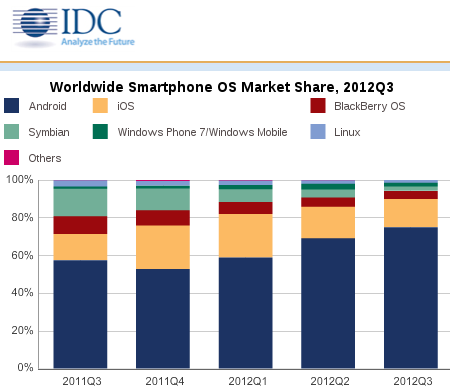 Android surpassed Windows as the #1 OS for Internet-enabled devices in Q1 2012. There will be 1 billion smartphone users but 5 billion mobile phone users by the end of 2012. Smartphone penetration, with all its astronomical growth numbers, remains low when compared to feature phones in most markets. By the end of 2013, Meeker expects there to be 160 million Android devices, 100 million Windows devices, and 80 million iOS devices shipped per quarter. By the end of Q2 2013, Meeker believes that the global smartphone plus tablet installed base will surpass the installed base of the PC.